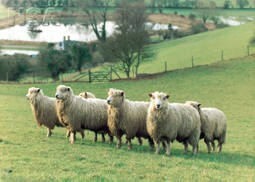 Cotswold Sheep are a large, polled, longwool breed. The head is carried well up, the back long, ribs well sprung, the frame and legs strong, giving an overall imposing appearance. The head has a pronounced forelock of wool and a white face, with dark skin on the nose. The high quality wool is white, lustrous and long-stapled. Average mature ewe weighs 85kg, rams 140kg.